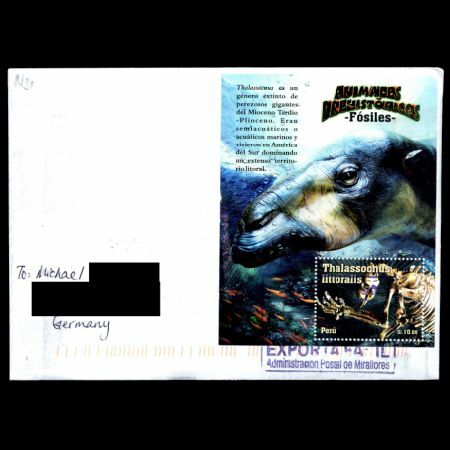 Peru 2010 "Prehistorical animals – Thalassocnus"
Author Cristian Alvarez M. –SERPOST S.A. Printed by Thomas Grag and Sons – Peru. In 2010 the Post Authority of Peru - Servicios Postales del Peru SA - continue to show natural heritage of the country discoverdon their stamps. 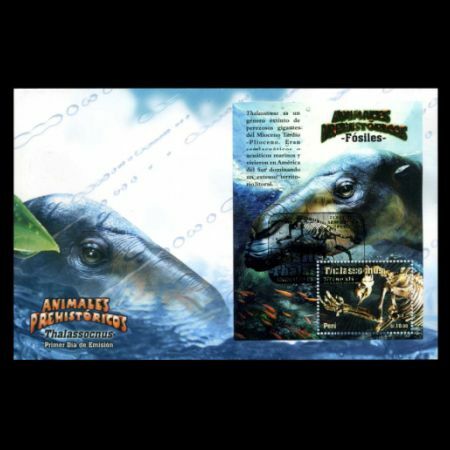 This year a block depcted scientific reconstruction and fossil of prehistoric sloth - Thalassocnus littoralis is added to "Prehistoric animals" (Animales Prehistoricos - Fosiles) set started in 2004. When you think of marine mammals, sloths are probably the last thing you’d expect to take to the water. But from the late Miocene (7-8 million years ago) to the late Pliocene (3-1.5 million years ago), several species of giant ground sloths in the genus Thalassocnus did indeed evolve to take advantage of the aquatic environment. However even some modern slots can swim. Official stamp description is below. "If there is something amazing about paleontology it is a capacity to show us that the life on the Earth, such as we know it nowadays, is the result of constant changes. Even the English naturalist Charles Darwin sketched his primordial ideas about the biological evolution inspired by fossilized bones of giant sloths and gliptodonts, the ancestors of little tree sloths and armadillos in South America. The evolution –developed 150 years ago in Darwin’s “The origin of the species”- is the concept that integrates all the sciences of life, now with the help of genetics and molecular biology. Like in Darwin’s time, fossils are the most inspiring resource for the evolution. Millions of years ago, the desertic area of Sacaco, north to Arequipa, was a littoral marine environment. In its sands lie hundreds of fossils of whales, dolphins, seals, penguins and sharks in excellent state of preservation. In 1967, french paleontologist Robert Hoffstetter visit the area, and was greatly surprised to find a terrestrial intruder: a sloth between aquatic species. It was inicially assumed that the sloth lived on land, near the littoral. Hoffstetter thought that their bodies were dragged into the sea by an andian paleo-river, where they were buried and preserved with aquatic species. However, something was wrong: the skeletons were always found articulated and complete, as if buried in the same place of their death - in the sea. What if it really was an aquatic sloth? This possibility, though wild, encouraged paleontologists Christian de Muizon and Greg McDonald to observe every bone's detail to look for revealing clues. 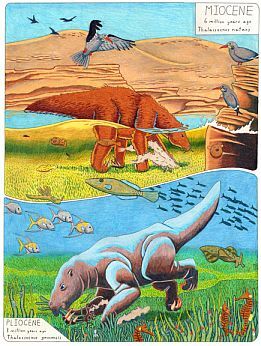 In 1995, Muzion and McDonald announced in Nature Magazine, the existance of a 4 million year aquatic sloth in Peru. 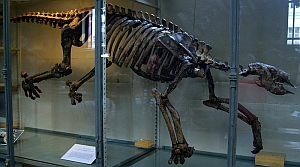 Some details of its anatomy, such as the shape of the premaxilla, femur and caudal vertebrae (the bones that make up the tails of tailed animals) , are more similar to certain aquatic mammals that to others extinct sloths. Various scientifics shown skeptic. After almost 15 years and many dicoveries made by Mario Urbina, 5 species of the aquatic sloth Thalassocnus were described, all of them found in marine deposits nearby Sacaco, but into rocks belonging to succesive epochs from 9 to 2,5 million years ago. This only record, let us track the first splashes in its linnage evolution, and also observe the way that certain adaptations to the aquatic environment were progressevely accentuated through time. Thalassocnus was a sloth the size of a large dog, with long tail and powerful claws. It had simple teeth with no enamel. Since the most ancient species (Thalassocnus antiquus) to the most modern (Thalassocnus yaucensis) several changes were observed, especially an increase in the length and width of the muzzle’s previous region, related to obtaining aquatic grass as a new source of food. The radius bone morphology shows substancial differences in the locomotion way. While Thalassocnus antiquus has a long radious bone with a reduced supinator crest, typical of terrestrial sloth, in Thalassocnus yaucensis the radius bone is short and the supinator crest is highly developed as observed in seals and sea lions. 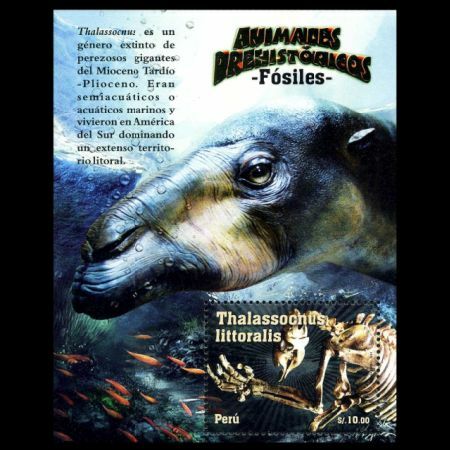 Today there is no doubt that Talassocnus was an aquatic sloth which spent a long time feeding into the sea; but what could have impulsed it to leave its quiet life on land to adventure amongst waves infested with sharks? Good question. It is known that the peruvian coast was already desertic in that epoch. Possibly the scarce vegetation in the coasted desert lead to the search of an alternative resource in the beached algae during low tide. After many generations, some of them adventured to look for algae and marine grass into the sea. As this survival strategy was good enough, those individuals who had small anatomical advantages to live and feed in the sea –therefore the more suitable - had more opportunities to reproduce and fix its genes in their offspring. The mechanism of evolution proposed by Darwin –natural selection- was on the road. In 2008, we published, with chilean colleague, at the Journal of Vertebrate Paleontology, the first remains of Thalassocnus discovered outside of Sacaco, almost 1500 km away, on rocks of marine origin in Bahia Inglesa (English Bay), in the north of Chile. This made us think that Thalassocnus dominated a vast littoral territory of homogeneous ecological characteristics. As we can imagine their bones were found among whale and dolphin remains. Recently, new Thalassocnus remains were discovered in Ica, 180 km north to Sacaco. The evolutive travesy of aquatical sloth Thalassocnus finished 2 million years ago. The bays of quiet warm water that existed for millions of years, made a way to a lineal coast of an agitated sea, just like we know it today. The wide cover of sea grass dissapeared and the Thalassocnus’ linnage was extinted. Instead, other terrestrial sloths evolved to become the largest mammals that lived in South America." Rodolfo Salas Gismondi. Curator. Verbratete Paleontology Department. Natural History Museum. UNMSM.